All About Real Estate Auctions: Let the bidding begin! When it comes to selling real estate, there isn't anything more exciting than watching a bidding war take place over your listing. The seller is excited, you as the listing agent are excited and the buyers are excited to participate. The above condo listing in Las Vegas is a great recent example. The seller had newly rehabbed this property and the winning bid well exceeded their "bottom line" price. 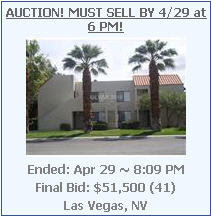 At the same time the winning bidder got a good deal compared to other sales in the complex. The important thing to remember when selling using an online auction is that you need to have scheduled open house "preview times" as well as good signage and marketing to let buyers know about it. Buyers in today's market are looking for deals and the "auction" activity draws them in. SOLD in 7 days or less! Is Craigslist an effective source of buyers? Why doesn't anyone notice you?